In 1980, Jean established BIOTONE and introduced her first product, Revitalizing Massage Oil, which is still available today. But it was the introduction of the BIOTONE Dual-Purpose Creme in 1984 that propelled the company to the forefront of the market. At the time, there were only oils and lotions for massage therapists to use. Jean thought the market could benefit from a massage creme that had the advantages of both – a lot of workability and could easily be washed out of linens. Her instincts were on target and the unique product caught the attention and enthusiasm of the marketplace. BIOTONE’s commitment is to develop products that are innovative and quality driven. 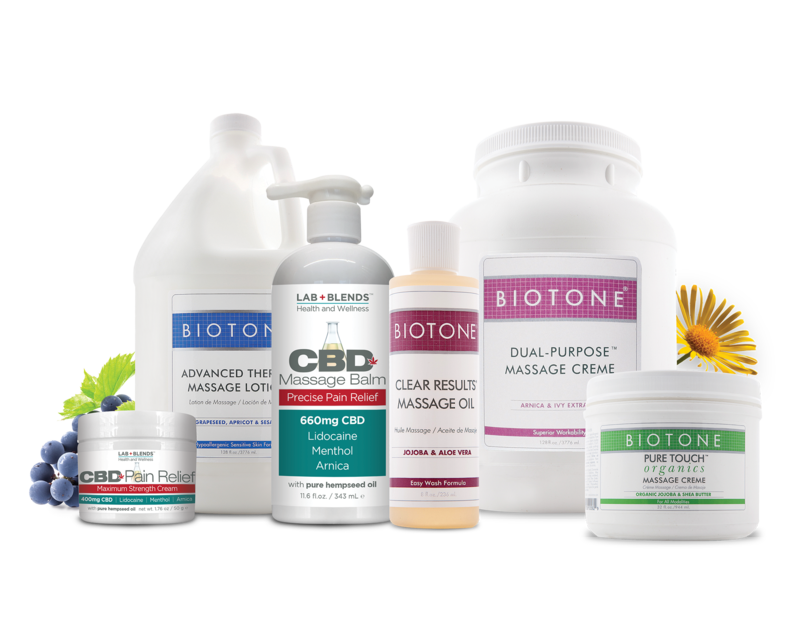 We have achieved our industry-leading position by providing a wide range of products to meet the various preferences of massage therapists and estheticians and their clients. The same care and quality that went into Jean’s first lubricant for the massage market goes into each hand-formulated product batch. Perfect for longer massage sessions. Light texture, this seed-oil based gel offers up to 25% more coverage than typical oils, so you use much less. Water-dispersible with Worry-Free washout. Gentle drag and extended, lasting performance for less reapplications. More glide and workability. Blend of bergamot, rosewood, coriander, sweet orange, grapefruit and ylang ylang. Blend of chamomile, lavender, rosewood, tangerine, petitgrain and balsam peru. Blend of mandarin, ginger, lemongrass, clove, cinnamon and sweet orange. Blend of mint, rosemary, lemongrass, bergamot, ylang ylang and litsea. Blend of lavender, orange, clary sage, litsea, patchouli and sweet orange. Blend of Peppermint, Lemon and Lime essential oils. Enlivening and energizing. Warm and spicy, promotes a sense of ease. Effortless workability with superior glide. Studies show Clear Results washes out more cleanly and completely than any other oil tested. Rich texture, smooth glide and extended workability. For deep, knotted muscles and trigger points. Non-greasy with minimum glide and maximum friction. World's most popular massage cream. Find out why! Healthy Benefits Massage Creme is a rich, thick formula with powerful anti-oxidants of Pomegranate, Green Tea, White Grape and Grapeseed. Deep skin conditioning and a light satiny feel, offers up to 25% mroe coverage than typical oils, so you use much less. Worry-free washout assures easy removal. Formulated for face, neck and decollete. Natural emollients infuse gentle hydration & nutrient-rich protection. Ideal for sensitive skin. Light, silky glide for luxurious full-body massage. Rich, thick product, will not pump. Refillable 7oz tube recommended for dispensing. Gel-textured feel without oily residue. Arnica, Hawaiian White Ginger, Bayberry and Violet Leaf stimulate circulation, relieve soreness, soothe and calm. Great glide over dense body hair. Active Botanicals of White lily, Rosehips, English Cucumber, Papaya; Aloe Vera Oil. Light emollients and natural botanicals won't clog pores. White Lily and Rosehips help moisturize and tone. 100% pure blend of Petitgrain, Lavender, Lemongrass and Rosewood essential oils. Botanicals of Arnica, Quince, Burdock; Lemon Bioflavonoids, Glucosamine Sulfate, Boswellia, Devil's Claw, Lemon Bioflavanoids helps promote joint wellness. Contains Arnica. Provides a smooth glide with a moisturized, non-greasy finish. Lightly scented. Botanical extracts of Arnica, Boswellia, Devil's Claw; Lemon Bioflavonoids, Eucalyptus, Bergamot, Balsam Peru and Wintergreen work together to assist in fast recovery. 100% pure blend of Lemon, Lavender, Geranium Rose, Peppermint and Juniper essential oils. Silky and lightweight, for all skin types. Lasting glide without greasy residue. Ideal for Swedish massage. Nutri-Naturals Massage Creme combines skin healthy, vitamin-rich ingredients to create a rich, luxurious creme that goes beyond basic moisturizing. Easy to apply and non-greasy, it provides an ideal glide that leaves skin smooth and nourished. Nutri-Naturals Massage Lotion combines skin healthy, vitamin rich ingredients to create a silky, emollient lotion that goes beyond basic moisturizing. Easy to apply and non-greasy, it provides gentle friction, and the ideal glide, that leaves skin smooth and nourished. Pure Touch Organics Massage Creme provides rich thickness hypo-allergenic qualities, in an unscented creme.